On Diamond CBD’s website, the company explicitly states that its products are “100% natural, lab tested, CBD extracts” and do not contain synthetic chemicals. The company’s site also provides “no indication that these products contained any other active substances,” the VCU researchers wrote. Following the study’s release in November, Diamond CEO Kevin Hagen told Consumer Reports that the company planned to retest its current products and recall them if needed. “The company strives to provide the assurance that we supply the best, highest-quality products on the market,” he said. In a phone interview this week, Hagen told Leafly that Diamond did indeed retest the products featured in the study and found with no sign of either DXM or 5F-ADB in the results. He said the samples in the Virginia study seemed to be purchased in 2017, when formulas were different. Public acceptance of cannabis has skyrocketed in recent years, even as it remains illegal across most of the globe. Prohibition has meant that using even legal hemp to manufacture CBD extracts can raise legal questions. At the same time, advances in lab technology have led to an explosion in products that claim to offer the same effects as cannabis by using various chemical stand-ins. One major area of this trend is synthetic cannabinoids, often referred to as K2 or Spice. These lab-produced chemicals are designed to stimulate the body’s endocannabinoid system, the same system that responds to cannabis-derived cannabinoids. The effects of each formulation vary, but users have reported feelings of sedation, well-being, disorientation, and—especially over time or in cases of overdose—nausea, fear, ataxia, and difficulty breathing. The drugs have also been linked to dozens of overdoses and potentially several deaths, leading to the classification of 5F-ADB and several other synthetic cannabinoids as Schedule I controlled substances. In some cases, these chemicals are suspected to have been marketed as CBD products in e-liquid or other forms.Diamond’s CEO told Leafly that Diamond has never included 5F-ADB or DXM in its products. 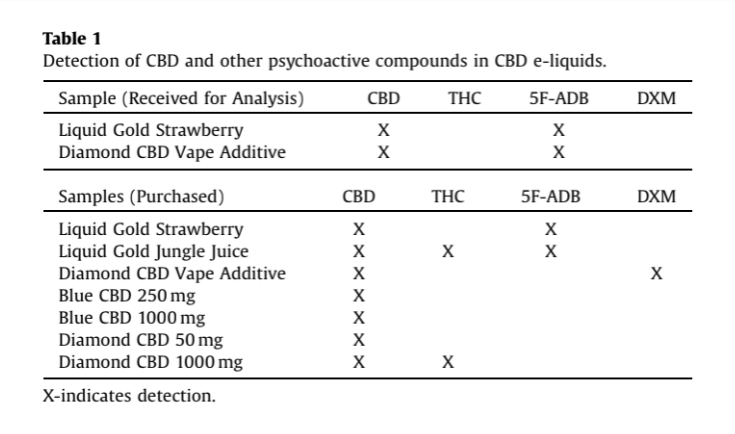 According to the VCU study, all of the tested Diamond products contained CBD as advertised, but samples of its Liquid Gold Strawberry and Liquid Gold Jungle Juice also tested positive for 5F-ADB. One product, known as Diamond CBD Vape Additive, was found to contain 5F-ADB in the sample given to researchers while a separate sample, ordered online, tested positive for DXM, a cough syrup chemical sometimes used recreationally. Some of the Diamond CBD products were also found to contain the psychoactive cannabinoid THC, which researchers called “expected” due to the trace amounts that occur naturally in hemp plants, from which the company derives its CBD. The VCU study found THC in two Diamond CBD samples, the synthetic cannabinoid 5F-ADB in four samples, and the cough syrup chemical DXM in one sample. Hagen told Leafly that Diamond has never included 5F-ADB or DXM in its products. He suggested that the adulterated products had either been tampered with or somehow tainted further up the supply chain. As a CBD retailer, Hagen explained, Diamond prepares its products using hemp-derived CBD oil, vegetable glycerin, and artificial flavors acquired from outside vendors. The company “has to rely on the lab reports they provide,” he said.RELATED STORYLeafly Investigation: Is Washington’s Top Cannabis Lab Inflating THC Numbers? Hagen acknowledged that “some” of Diamond CBD’s approximately 300 products do contain melatonin, a hormone produced naturally by the body—and sometimes used as a dietary supplement—that signals to our brains that it’s time to go to sleep. He said his team got the idea of using melatonin from another vendor at a trade show a few years back, and also added it in response to customer requests for CBD products to help them sleep.Hagen said he supports expanded regulation over CBD. Hagen said he wasn’t sure which, if any, of Diamond’s products are described online as containing melatonin, noting that such products aren’t marketed specifically for sleep. A Leafly review of the company’s website found references to “a dash of melatonin” in some products, specifically the company’s “Relax” and “Chill” lines. And while some product descriptions list melatonin as an ingredient, CBD appears first. That suggests CBD should be more abundant in those products. Hagen stressed several times that he and his family members regularly consume Diamond CBD products and that the company strives to follow best practices in the evolving industry whenever possible. “I’m not willing to jeopardize my family and friends, or anyone for that matter,” he said. Is Industry Growth Outpacing Safety? Diamond CBD is far from the only e-liquid seller to face scrutiny in recent years. Yet due in part to the lack of state or federal regulation over such products, companies flagged for selling contaminated CBD are generally able to continue business as usual. Diamond CBD already has a large audience and customer base. It’s sought to position itself as an authority on CBD products—and may very well be seen as such by consumers. But as with many other large CBD retailers, aspects of its products and practices remain publicly unknown. Paul Armentano, deputy director of the National Organization to Reform Marijuana Laws (NORML), told Leafly that previous studies on consumer e-liquids have turned up similarly unexpected and potentially dangerous chemicals, highlighting what he said was a need for both government regulation and extreme care on the part of patients and consumers. Justin Poklis, the lead author of the Virginia study, told Leafly that oversight of these products is crucial to consumer safety. After examining e-liquids and synthetic cannabinoids for about 10 years, Poklis said, he’s become quite familiar with the kinds of synthetic products on offer and the ways they’re promoted on packaging and in advertisements. Poklis recalled the psychedelic packaging on early K2 products labelled “not for human consumption” and ordering samples from sites like IAmStoned.com.